It’s a sad commentary about my life that I am sitting here in mid-December still trying to finish writing all the demos I did photo work for during 1776 last spring. Life’s been a little crazy lately. Great/fantastic/amazing (grantasticazing? ), but crazy. 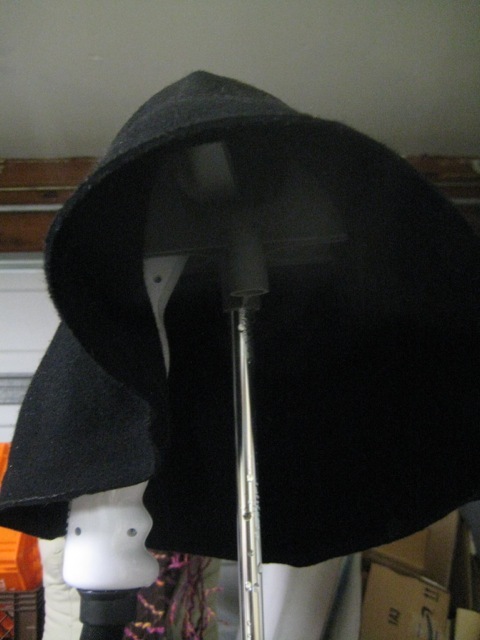 Anyhoo… One of life’s great mysteries seems to be “How do you alter a hat?” I’ve talked about straws, which are basically a “just add water” operation. Reblocking felts is slightly more dangerous exciting, because you get to play with steam. Ready? Your “something roughly the size/shape you’d like the hat to become” is traditionally a hat block, but those buggers are pretty pricey. I’m using one in this demo, only because the college lets me borrow things, and because, quite shockingly, we actually had a 26″ block in roughly the right shape. Seeing as I was making a puritan hat, I fully expected to be using a flower pot. I was kind of sad, in a way, but I got over it. 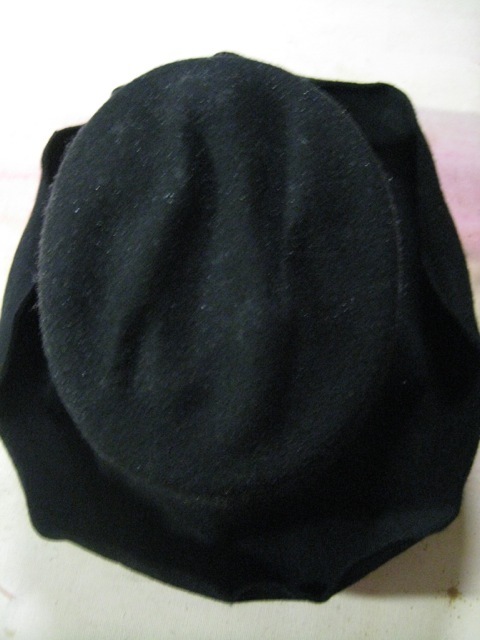 The victim-hat - it came with a sewn in scarf to tie under you chinny-chin-chin to keep your ears warm. Always a sign of exceptional millinery... Le sigh. I found it in a bin at the theater. My community theater, oddly, has a policy against mutilating existing stock, but ,,, As a friend put it, “My god! I wouldn’t wear that hat, and I’m British!” Sometimes, saving an item is less important than saving someone from putting it on their body. Unroll the brim (if needed). 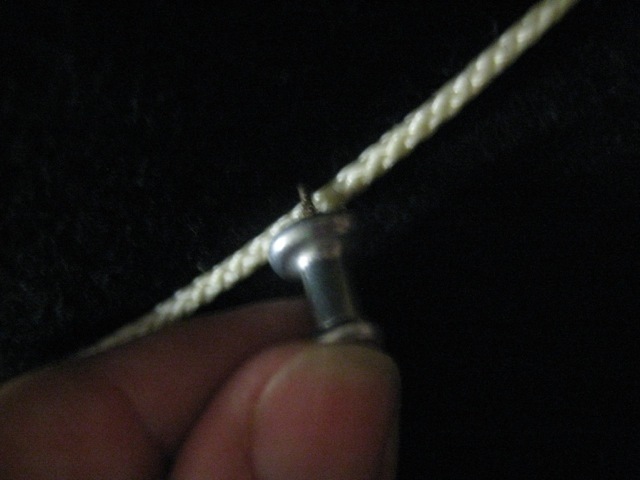 If there's stitching around the edge of the brim, undo it and remove the wire it's holding. 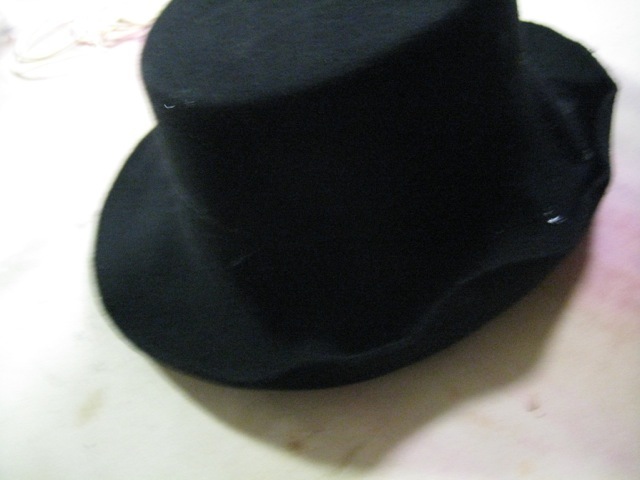 Remove the hatband - in a perfect word, you won't find hot glue. If you do find the glue, you can remove it with your thumbnail, a safety razor, or a razor knife depending on how confident you are and how much you care. 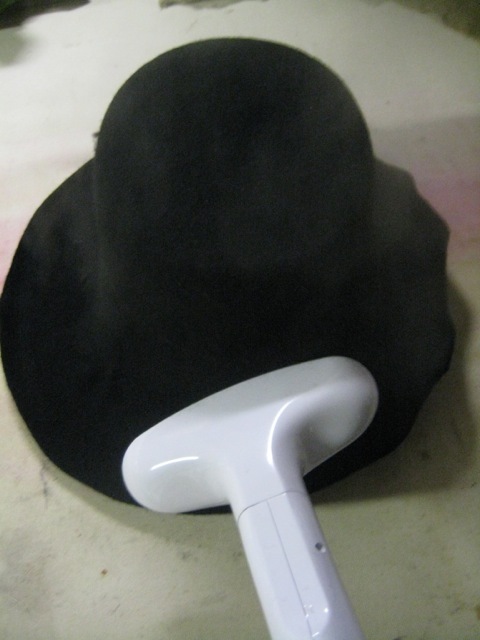 Put the hat on the steamer. Put the garbage bag over the hat. Congratulations - you've just make the world's cheapest steam box. Let the hat steam for a couple minutes, then remove the bag. Rotate the hat slightly and replace the bag. THIS IS WHERE I ALWAYS BURN MYSELF. Steam the hat until it surrenders. You'll know because the hat will be all floppy. 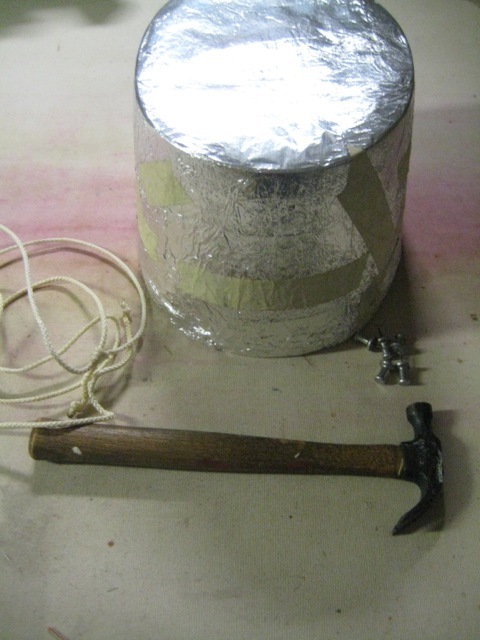 This is where you need the block (cover it with tin foil or plastic wrap if it's wooden), the cord, and possibly the thumb tacks and hammer. Remove the redonkulously hot felt from the steamer and slap it onto the block. Stretch the hat down over the form. This may require significant brutality. Ok, so we all know that missa is prone to a little bit of festive exaggeration in her descriptions…. This part is straight-up truth: blocking hats requires some muscle. I call it hat wrestling – unless the shape you’re trying to make is darned close the the shape you’re starting with or smaller than the shape you’re starting with, you’re going to be grabbing opposite sides of the hat with both hands and using your body weight to try to force it down. Re-grip, repeat. I had a millinery teacher once caution me not to rip the felt. This is good advice, but I don’t know if it’s possible. I’ve never managed, and I brutalize those things when they get feisty with me. 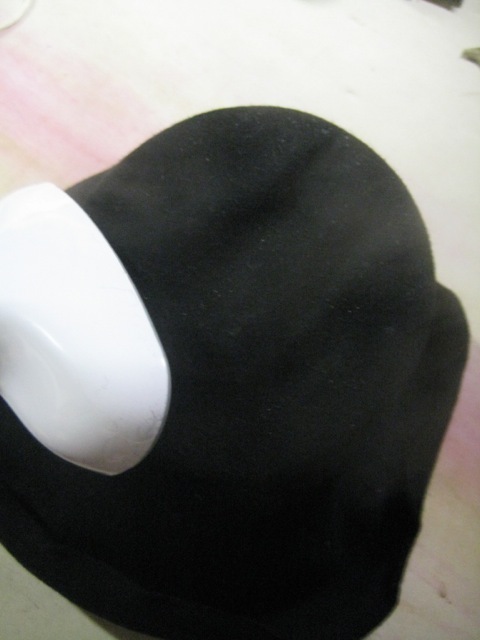 If the hat begins to become less than painfully hot, add more steam to keep it pliable. To get rid of excess felty-wrinkles, add more steam. 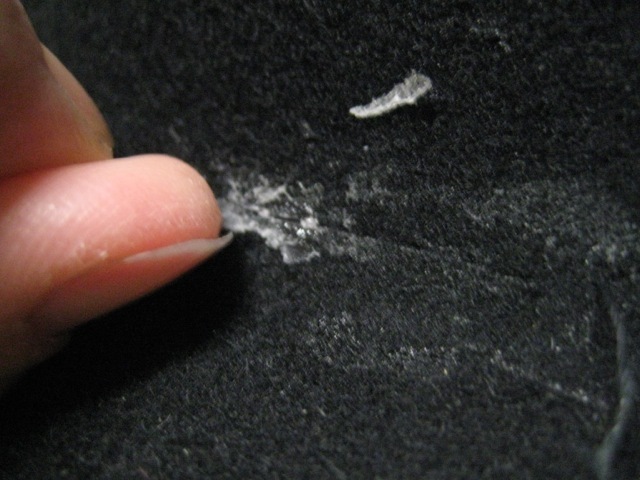 In addition to keeping felt pliable, steam also makes it shrink. 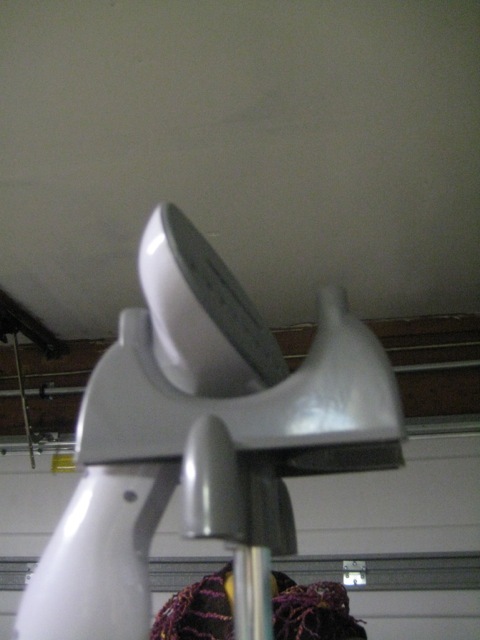 Ultimately, you'll be able to iron it flat with the steamer. With a little patience and a lot of steam, we're half way home. To change the shape of the brim, you'll use... *drumroll* MORE STEAM. This is generally easier than blocking the crown, and less likely to require significant brutality. Half the brim is done, since I just want it flat. This is a good time to talk a little about the theory, here, since flat is one of the more obnoxious shapes to try to attain. If you’ve got a hat that started with a rolled brim, like I do, the very edge of your brim is way smaller than the middle of your brim. Mere steam will not be enough – you’re going to have to go back to muscling the felt by stretching the edge between your fingers. I stretch about 2″ at a time. As you stretch one area, another will shrink. Just be patient with it. As you're working on the brim, you will probably notice that the crown is being stretched away from the block. This is where the cord comes in. 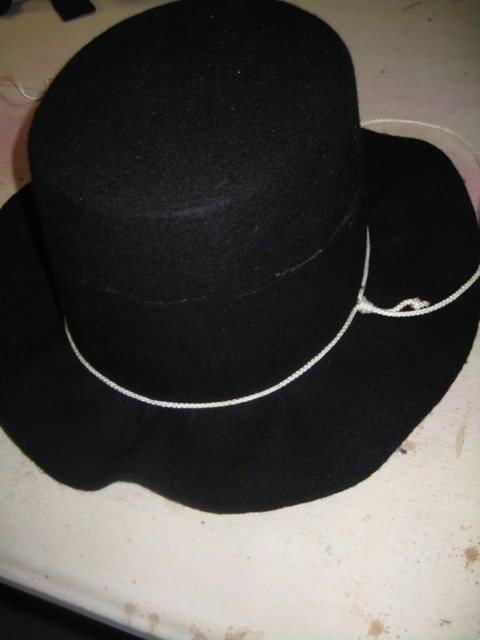 Tie a slip knot, and use the cord to cinch the hat in around the base of the block. Shrink the crown back down with steam. Why not do that first and avoid the whole problem, missa? That would make sense, and I was taught to put the blocking cord on as soon as possible in the process. I just find that the darned cord gets in my way, so I don’t like to use it until I’m done with the heavy lifting and really just straightening out details. 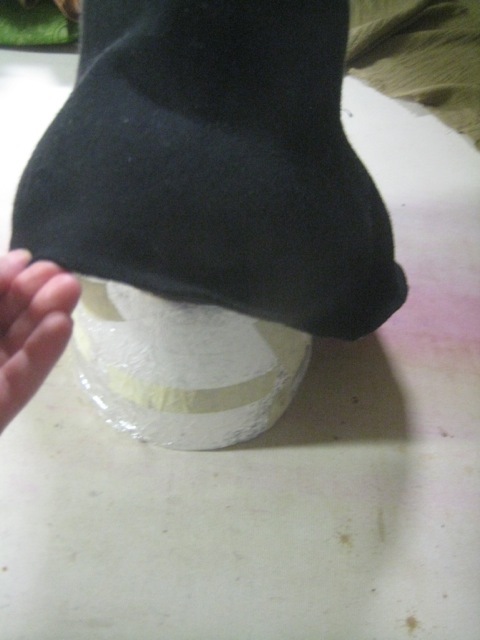 It’s also very common practice to block the crown, cut the rest of the felt off, and block the brim separately. 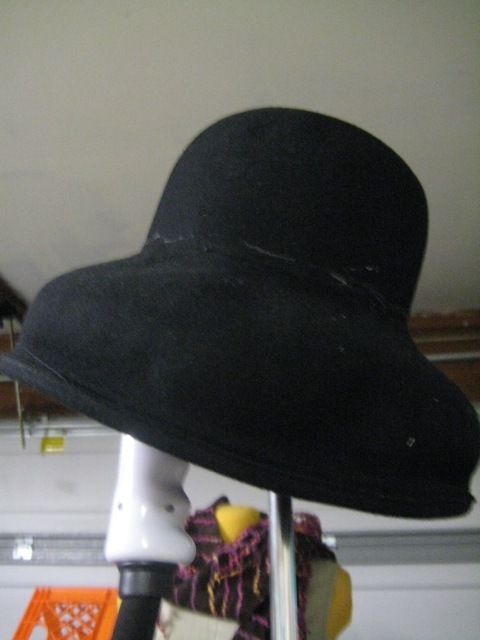 I’m trying to turn a 23″ woman’s domed hat into a 26″ tall puritan jobby, so I really don’t feel I have a millimeter of felt to spare. If the blocking cord is moving around and the object you're using as a block is pinnable, you can pin the cord in place. This is also where the little hammer comes in to play. I try not to do this, because it leaves little holes in the felt. Now let the hat dry. All that steam has pushed a whole lot of water into the wool, so this can take a day or two. The hat needs to remain unmolested until it's dry. When it’s dry, take if off the block and spray it with sizing to help it keep it’s shape. In a perfect world, you should tack in a hat-band so that the crown doesn’t stretch. In an imperfect world, your hat is destined for the stage. If that’s the case, I endorse the highly-inappropriate method of sizing the snot out of the hat by painting on layers of diluted white glue. This also makes it a little easier to get makeup off the felt. Just discovered your site, and love, love, love it! I’m a self-taught milliner for our local theater, and have had lots of fun with figuring out giant pretzels, German Shepherd, sausages (with sauerkraut), etc., headpieces for “The Producers,” pyramids, cobras, giant lotuses (loti?? ), for “Aida,” and hundreds of “regular” period costume hats. Your descriptions are just too entertaining! Thank you for some great info and lots of laughs! Oh, cool! Karen, I’m a little jealous! :) I’m glad you enjoyed the blog, and keep rocking out the fantastic creations! *laugh* I so need an excuse to make a sausage and sauerkraut hat not. Tee hee…. 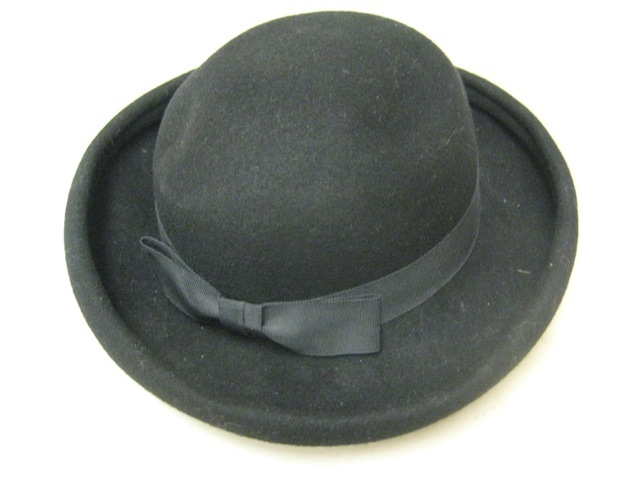 SWhile looking for information on finishing and wiring a felt hat brim, I stumbled on your blog. 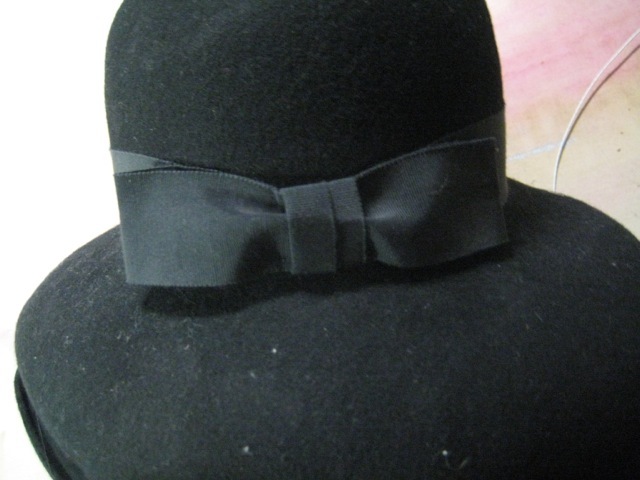 I have been in millinery business for just over a year and I am teaching myself as I go along. Just blocked my very first mad hatter in one piece. After 3 attempts I think I got it. Your description on how to is very entertaining and I enjoyed reading it. It was just what I needed after a stressful day blocking the hardest thing I have ever worked with in my life….. sore fingers, burnt, and totally frustrated that I nearly tossed it out of the window!!! 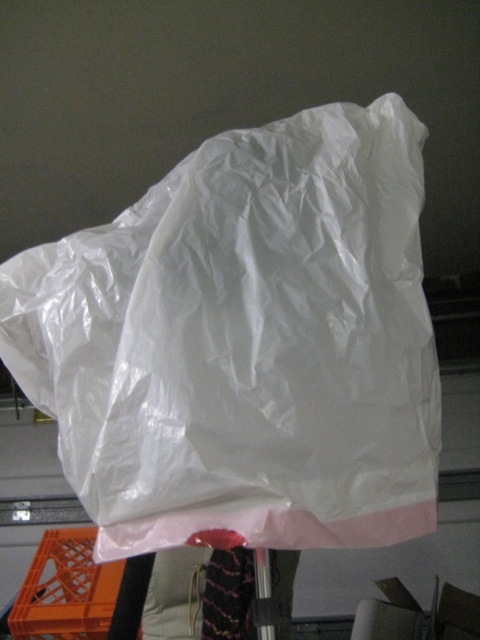 So now how in earth do I attach wire and fold over the brim…. 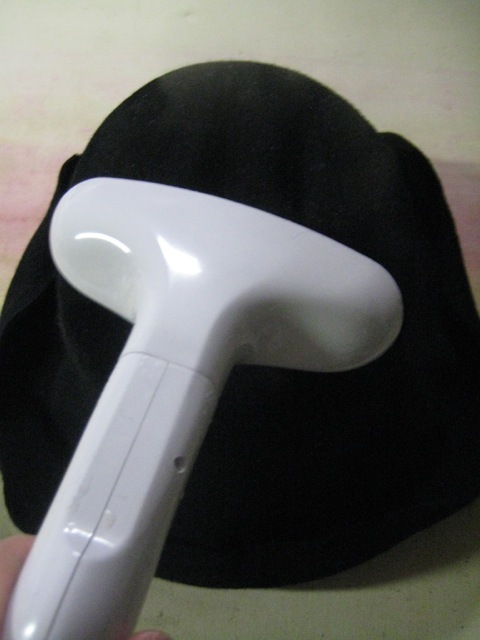 You fold over the brim by using a steam iron to make the outside edge of the brim smaller than it was previously. Usually that’s a lot like ironing up a hem on a circle skirt, but, as with all things millinery, proportionally more persnickety and annoying. ;) Rather than trying to get the edge turning in one go like you would with a hem, I would recommend working with the hat perpendicular to the table (like a wheel on a road). Use the iron just on the edge of the brim, so you can start getting the fold into it. The *traditional* way to attach the wire is by hand with a blanket stitch. The *fast* way is by machine with a zig-zag. 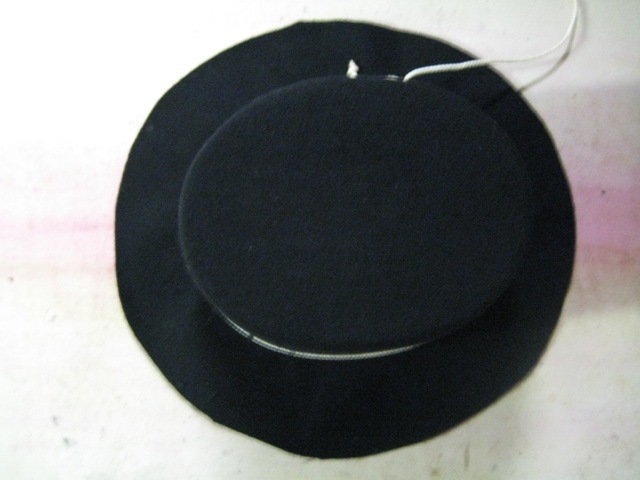 Mind you, the *easy* way to wire a felt brim is to zig-zag on the wire and then cover the edge with folded petersham or bias, if you even need to wire it – felt does have a bit of body, and a smallish bring might need nothing more than heavy sizing. The secret ingredient hatters use but won’t tell you they use is shellac. You can stiffen a brim or saggy crown by putting light coats of shellac underneath the brim and inside the crown instead of diluted white glue. 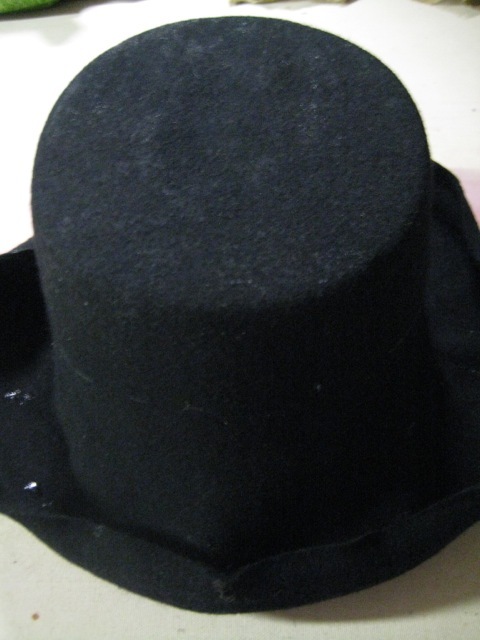 Careful, paricularly with light colored felt, as shellac can soak through and spot the hat if you put on too much. One little coat brushed on carefully. Let dry. Repeat till you get desired stiffness. 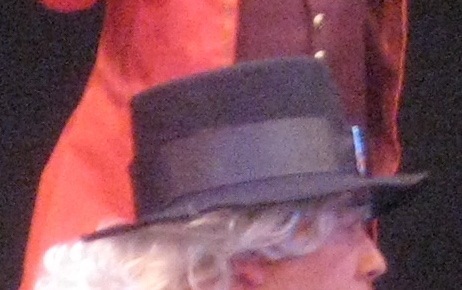 Old hard felt hats like derby or felt top hats require many coats. 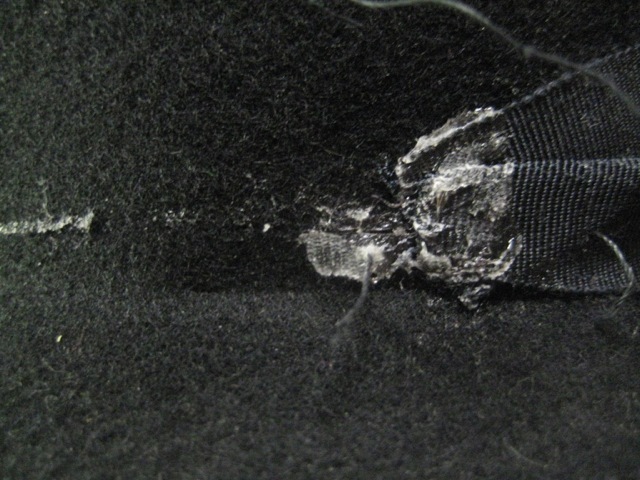 Since they are black, I suspect they used to just shellac both sides of the felt, but I stick with my method. Shellac also works with too-floppy straw hats, unless they have been painted or sealed with a thick coat of clear paint or lacquer. You have to sand away that old finish with steel wool. These new paper straw hats are rubbish if hit by rain. By painting them with clear, semi gloss paint you can make them water and sweat stain resistant. I’m interested in making hats, glad to have found your site!